Usage notes: Used extensively—and almost exclusively—in spoken French, the expression quand même has a multitude of meanings. 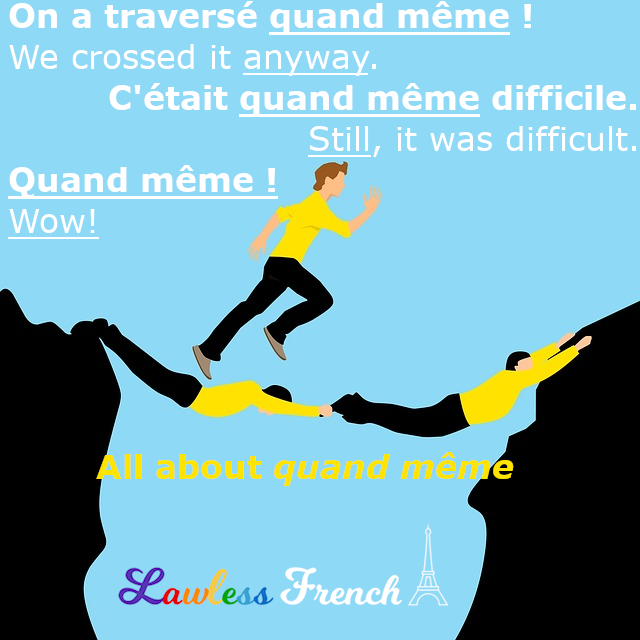 The original meaning is also the simplest: quand même is an adverbial phrase meaning something like "still" or "anyway" when you can’t, shouldn’t, or don’t want to do something. Je suis très occupé, mais je vais quand même à la fête. I’m very busy, but I’m still going to the party. Fauché, il m’a quand même acheté un beau cadeau d’anniversaire. He’s broke, but he still bought me a nice birthday present. Merci quand même. Thanks anyway. Bien que je sois / Même si je suis très occupé, je vais à la fête. Even though I’m very busy, I’m going to the party. Bien qu’il soit / Même s’il est fauché, il m’a acheté un beau cadeau d’anniversaire. Even though he’s broke, he bought me a nice birthday present. Merci, mais je dois refuser votre proposition. Thank you, but I have to refuse your offer. Related to the first meaning, quand même can indicate unexpected, contradictory, or adverse conditions. C’est quand même difficile. All the same / Even so / Actually / Still, it’s hard. C’est un peu acide, quand même. (en mangeant de la glace à la cerise) It’s kind of sour, surprisingly. Quand même can succinctly reference the overcoming of adversity. France toujours ! France quand même ! This 1914 etching by Gustave Fraipont depicts French soldiers throughout history: "France forever! France against all odds!" "Life goes on" and "Back to normal" are missing something; maybe "Triumph over / after adversity" is the best translation. Informally, quand même can be used for emphasis. Fais attention, quand même ! Hey, pay attention! Quand même, ça suffit. OK, that’s enough. C’est beau, quand même. It’s really beautiful. Quel imbécile, quand même ! Wow, what a fool! Quand même can indicate a strong reaction like surprise, disbelief, or outrage. I think this is the trickiest to understand, and hesitate to use it for fear of being misunderstood. – Quand même ! – I won! – Je suis trop fatigué pour sortir. – Il n’est pas si tard que ça, quand même ! – I’m too tired to go out. – Come on, it’s not that late! Quand même, Juliette ! Honestly, Juliette! What were you thinking? Oui, mais quand même ! Yes, but still! Quand même with a future construction indicates that whatever you’re thinking about doing is probably not a good idea. Tu ne vas pas sortir en catimini, quand même. You’re not really going to sneak out, are you? Ils ne vont pas divorcer pour une question d’argent, quand même. Come on, they’re not really going to divorce over money. Recognition of effort or a saving grace. Tu as essayé, quand même. At least you tried. Il est honnête, quand même. At least he’s honest. Native speakers always point out that quand même should follow the verb directly, but in my experience, it’s almost always said at the beginning or end of the sentence. – J’ai fait la lessive. – Ah, quand même ! – I did the laundry. – Oh, quand même. – Thank you so much! Quand bien même tu partirais maintenant, tu serais en retard. Even if you left now, you’d be late. Quand même was French actress Sarah Bernhardt’s motto, but which meaning to ascribe to it is a matter of some debate. I lean toward the word play of two translations: "nevertheless" (which is apparently something that actors like to say in response to direction) and "overcoming adversity."